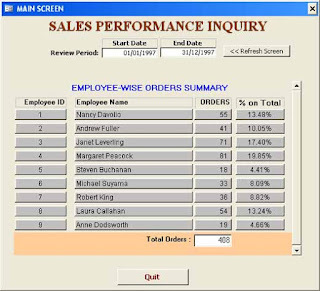 The top layer of the Form shows Sales-Person level summary of Orders and the Percentage on Total Orders. 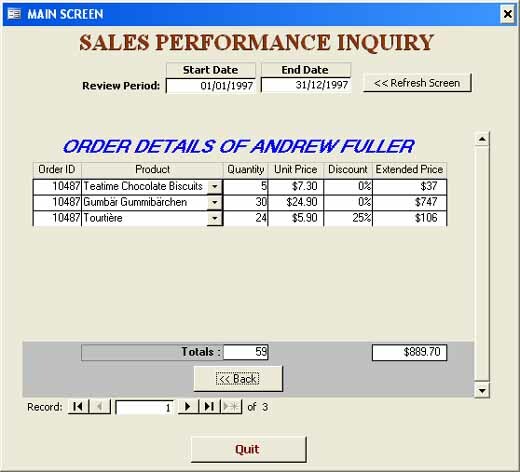 At the Footer of the Form shows the Total of all Orders put together. 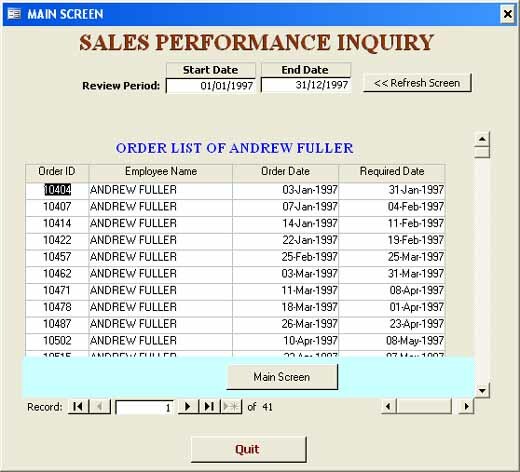 When clicked on a particular Employee's record the individual Order-level Summary information will be visible on the main screen overlaying the earlier view. Check the image given below. 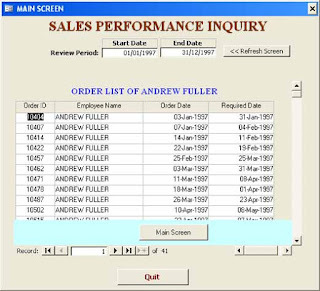 Several items can be ordered under a particular Order and details of all items can be displayed by Clicking on one of the Order record. Check the image given below. 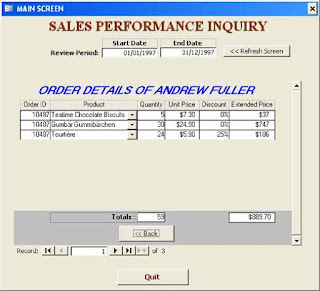 The above Form shows order-level details and summary information at the Footer of the form with Total Quantity of all Orders and the Total Net-Value of all items after discount. The Command Buttons at the footer of each form is used to switch the view back to the upper layer of the form. The Date Parameter values at the top can be changed to display information for a different period. First of all, I would like to assure you that there is no complicated VBA Code to drive this design except one or two lines of them here and there to refresh the controls and for switching from one layer of the form to the other. Other than that the entire Screen works on Queries and Forms. We need few Tables from Northwind.mdb sample database, to create six simple Queries, three Sub-Forms and a Main Form to organize all of them together to present the information to the User. If you would like to see the Inquiry Screen in action before you design it, you can download it from the bottom of this post and take a look at it. If you find it difficult to figure it out how it works or how to put all of them together then come back and go through the design task step by step so that you will know how simple or difficult it is and how each element of this trick works together with others. Here, we will see the usage of Transparent Command Buttons again, which we have already seen in an earlier Article with the same Title. We will have to split this topic into more than one Blog-Post so that we can do the design task with ease. Even though I can show you how to do it in few minutes, explaining that on paper with images and Property settings takes lot more than that. 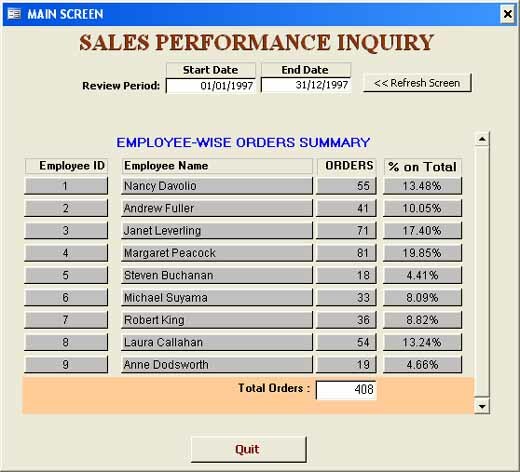 I know, if you download the database and take a look at it first, you will be better prepared to find out more about it and ready to go through the design task with more interest. So, let us start the first part. Open new Queries and Copy the following SQL Strings into Query's SQL Editing Window and save them with exact Name given for each of them. 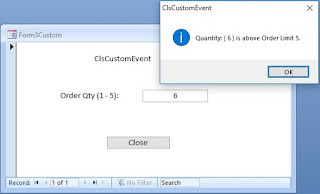 Create the Queries in the same order as given here as they have dependencies on Queries created first. Ive recently started a blog, the information you provide on this site has helped me tremendously. Thank you for all of your time & work.